We all know we should exercise more, but most of us are too busy or too tired, find exercising too challenging and boring, in reality we hate it! Here is the solution – make exercise more fun. In fact, do not look at it as exercise, do what you like to do – play games, sports like football, basketball, soccer, etc. and have fun! The best exercise to lose weight is the one you enjoy! Active games are one of the great fun exercise ideas. Play games such as bowling, boxing, baseball, jump rope, ice skating, roller skating, football, skateboarding, aqua jogging, hiking, swimming, tennis, aerobics, fitness dance, canoeing, golf, paintball, playing catch, ping-pong, volleyball, wii sports games - you name it. 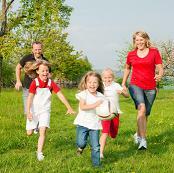 Playing games can be great fun for you and fun exercise for kids. Love dancing? Then why not dance to lose weight? Love watching the “Strictly Come Dancing” TV program or “Dancing with Stars” – why not try it yourself? Find Ballroom Dancing, Ballet or Salsa classes in your area and you will lose weight fast easily. Dance workouts are not only a great form of cardio exercise, but also one of the best workout routines for toning your body. You can burn as many calories dancing, as calories burned running, walking and swimming. Check our calorie burn calculator to see how many calories burned when dancing. Maybe you like holidays and sightseeing? Walking holidays can be great fun. Walking exercises are the easiest way to lose weight as they do not need any special skills, or equipment, and you can do it any where and any time. If you love travelling, new places and nature – find a holiday walking across your country, walking coast to coast, or a walking holiday in a warm exotic country. According to studies an average female shopper will walk for 2.02 miles to choose the purchase she is after. A one mile walk burns about 100 calories. 39% of women believe that active shopping demands the same energy as a gym workout. However, men are less committed to shopping. Love shopping? So, shop until you drop!.....drop a dress size! According to a University of Missouri-Columbia study, 20 min 5 times a week dog walking can result in losing 14 pounds over a 50 week period. Many participants admitted that they walked for the study not because it was good for their health; they enjoyed walking as they new it was good for their dog. The commitment to the animal made them stick to this easy exercise routine. Do not have dog yet? How about finding a dog walker job in your spare time and get paid for your exercise - get paid to lose weight. Choose the activity you love, stick to it 4-5 days a week, have fun and enjoy it - without realizing or even noticing, you will get fit and healthy. The best weight loss exercises are the ones that you really enjoy!